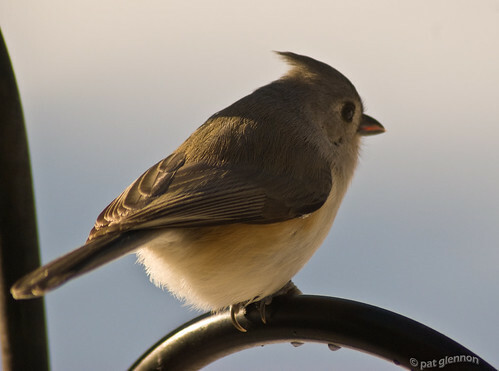 Tufted Titmouse (348/365) – Annoyingly Boring? Sitting atop the feeder stand in my backyard. Shot through my kitchen window, along with a few others. I loved the texture in the feathers on this one. As with all my 365 shots you can click on it and be taken to my Flickr account where you can see a large version. Love it! Your kitchen windows are much cleaner than mine. oh, yeah like i totally didn’t have to clean the window before shooting through it. riiiight. PG.. this is a beautiful shot.. well done! Kims last blog post..Maybe we should rethink the 529 College Savings? Rupe always loved the name of this bird ….. This is what it’s all about! I love it. I have always wanted to be able to get bird pics like this. I guess i need a new camera. Karens last blog post..An Award! Karen – they say the camera will not make the photographer, but there are things that the correct gear will allow one to do, that otherwise would be unapproachable. Nice – one of your best of the year! nice pic, pat. how thrilled are you with the new camera? Wow, I can just FEEL those soft feathers! So cute!